SCDOT has identified the 22-mile segment of I-85 between US-25 (White Horse Road) in Greenville County and SC-129 (Fort Prince Boulevard) in Spartanburg County in the Department's Interstate Long-Range plan as a priority capacity need based on adopted ranking criteria. The I-85 Corridor is a vital transportation link between Greenville and Spartanburg locally, as well as between Charlotte and Atlanta regionally. The I-85 Corridor currently experiences a high amount of traffic with a large percentage of trucks utilizing the Greenville-Spartanburg segment. SCDOT is faced with the challenge of resolving the current congestion issues while maintaining I-85 as an efficient and viable multi-modal transportation link for the future. This study will identify ways to reduce congestion and improve traffic flow along the I-85 corridor for present traffic conditions as well as forecasted future traffic. Traffic analysis, travel demand modeling, corridor geometric evaluations, and identification of strategies will be utilized in determining the plans to improve the congestion along the I-85 corridor. Current and projected levels of congestion will be measured, travel patterns will be identified, vehicle demand by mode and vehicle type will be investigated, and potential impacts/benefits to adjacent general purpose lanes will be studied. 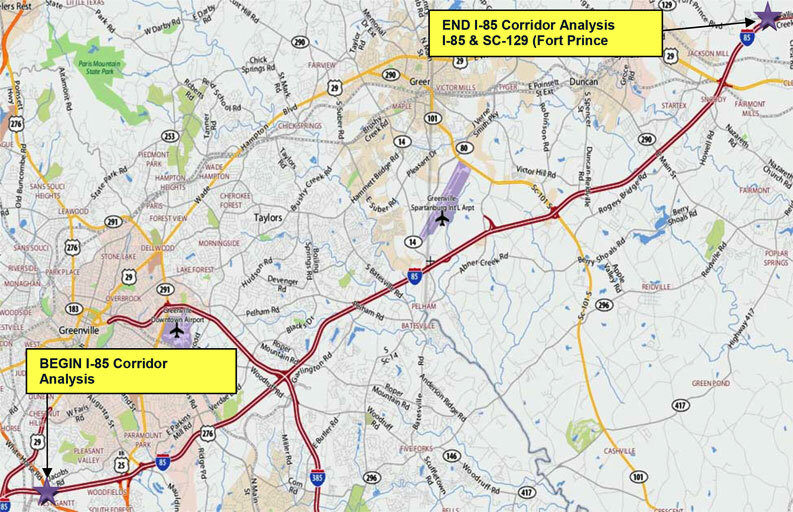 This corridor study will identify a series of potential projects to improve the I-85 corridor. These projects will be separated into three groups based on estimated construction costs as follows: up to $10 million, between $10 million and $100 million, and over $100 million. The projects will most likely be separated by phases and may involve a combination of various improvement alternatives. In June 2012, the SCDOT Office of Planning accepted and approved the final report from Civil Engineering Consultant Services (CECS). The final report gives detailed explanations, diagrams, and cost estimates of all aspects of the project that were undertaken and completed. The following documents are a collection of reports related to the I-85 Corridor Analysis.